Unlike the past, today’s butternut squash flesh is sweet and tender, palatable to both kids and adults alike. But many folks don’t realize how much nutritional benefit butternut squash imparts. It contains very high levels of vitamins A and C, key immune supporting nutrients important for warding off illness like winter colds and flu. It is also rich in fiber. While it contains a large amount of carbohydrates and is known as a starchy vegetable, there is growing evidence that certain pectins in the starch may have additional anti-oxidant and anti-inflammatory properties and may even help regulate blood sugar. The hard outer skin of butternut squash is a double-edged sword. While it can be challenging to peel, it serves as a great preserver so that if kept in moderately cool, dark conditions (ideally 50-60 degrees) whole squash can keep for up to 6 months. Many opt to buy their butternut squash pre-peeled and cut to avoid having to deal with the skin. However, there are significant trade-offs to this practice. One, prepared butternut pieces are expensive, costing up to fives times the cost of whole squash. Second, once butternut squash is peeled and cut it loses nutrients like antioxidants rapidly. Third, many swear that pre-packaged butternut squash tastes bland and boring. Thus, it pays to learn some tricks to make peeling these squash easier. One of the easiest ways to peel whole butternut squash is to first microwave it. The heat softens the skin and makes it easy to peel using a sharp vegetable peeler. Simply poke a few holes in the squash and microwave for three and half minutes. The second way to peel butternut squash is to first cut off a bit from both ends to make a flat surface. Then cut the squash in half between the neck and the bulb. Stand the neck up on its cut end and using a sharp knife, cut down from top to bottom removing the peel in strips as you work your way around the stem. Repeat with the bulb end. If using butternut pulp for soups or puree, simply roast the squash with the peel on, then scoop the flesh from the peel once cooked. The fastest most efficient way to do this is to carefully cut the squash lengthwise down the center (you will need a sturdy sharp knife). Using a spoon, remove the seeds and loose pulp. Brush the flesh lightly with olive oil and place cut side down in a baking dish. Cover with foil and bake until soft. Remember to use the seeds. Place the seeds and loose pulp in a bowl of water and swish around, using your fingers to separate the seeds from the stringy pulp. Pat dry the seeds and toss them with olive oil. Sprinkle with salt and any other seasoning you desire (cinnamon, smoked or regular paprika, cumin, or fennel salt all work well). Bake in a 170-degree oven for about 20 minutes. Baking the seeds at a low temperature preserves the important antioxidants and nutrients in the fats. However, if you prefer more traditional style baked seeds I like the following method. Boil in salted water for 10 minutes. Drain seeds and pat dry. Toss with oil and seasonings and bake in a 350-degree oven until just lightly browned (be careful, they burn easily). I have recently discovered a fun way to prepare butternut squash. I pulse squash pieces in a food processor until they resemble rice and then saute the bits with onion and seasoning to make a “pilaf”. The result is an interesting dish that is a great substitute for rice for those on a grain free diet. It is also a boon for those wishing to increase the vegetable quotient of meals. 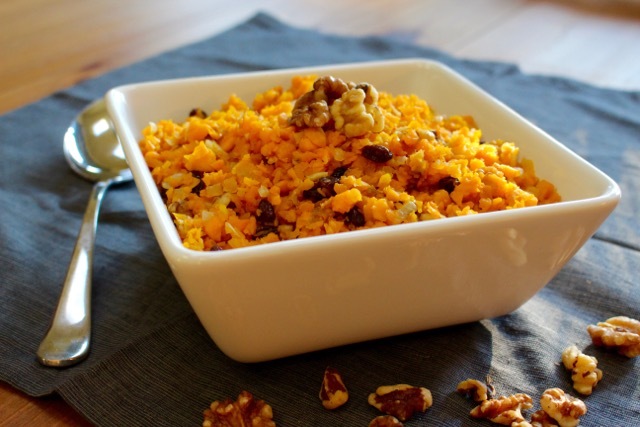 Butternut pilaf, like rice, is wonderful with any dish that contains a sauce, as long as the flavors of the dish compliment the flavors in the pilaf. The following recipe is one of my go-to rice alternative accompaniments for hearty fall braises like lamb stew or brisket. It is also good on its own as a side dish. You can also make a meal out of it by adding in ground meat or chopped tempeh (just increase the salt and cinnamon). Place half of butternut squash pieces in a food processor and pulse at 10 second intervals until they resemble rice. Remove to a bowl and repeat with remaining squash. Set aside. In a large skillet, heat oil over medium heat. Add onion and cook, stirring occasionally, until onion is soft and translucent, about 8-10 minutes. Add garlic and cook, stirring, for 1 minute. Add broth, raisins, cinnamon and salt. Cook, stirring occasionally, for 20-30 minutes or until squash is to your desired level of tenderness. Stir more frequently in the last 10-15 minutes to keep the squash from sticking to the pan. If sticking becomes a big problem add more broth. Remove from heat as soon as squash is mostly tender but before it starts to get mushy. Off heat, stir in lemon juice and toasted nuts. Season to taste with additional salt and pepper. Serve. Julie Wern is a psychologist turned stay-at-home-mom turned caterer. She is currently in training at the Institute of Integrative Nutrition to become a Nutrition and Wellness coach. She is the author of Holcomb Farm CSA’s Simply Fresh blog (http://holcombfarm.org/blog)and currently teaches cooking and cookie decorating classes. Contact Julie at: jwern@comcast.net for comments and inquiries.